And third: Getting the feeling for the correct action. (This is most important). 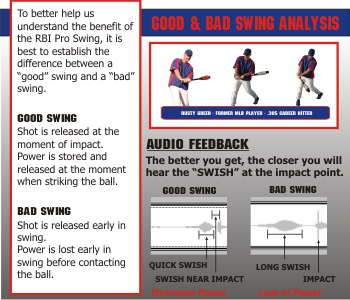 The RBI Pro Swing does exactly this. It helps the hitter get the “feel” for the right action and gain an understanding of the best technique for hitting a baseball. 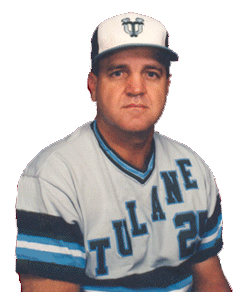 The best teaching products in baseball are those that not only teach the hitter proper mechanics, but they also teach how to build the habit of getting it right. There is an old saying, "Practice makes perfect." But practice doesn’t always make perfect. Practice makes permanent. Therefore, imperfect practice will never be productive practice. The RBI Pro Swing guides the hitter to develop the perfect stroke. It helps him get the “feeling” for the proper action and produce “perfect practice.” The RBI Pro Swing therefore becomes a good friend, always there to be used over and over again to build good habits. I recommend having a hitting practice schedule that includes the RBI Pro Swing on a regular basis, knowing that using it properly will improve hitting by getting the feeling for the proper stroke, and developing good habits by using it repeatedly. At point of impact, hands and body uncoil quickly to transfer maximum energy to the ball. The transfer of energy is illustrated through the SWISH or POP of the shot as it travels through the RBI Pro Swing chambers. In order to illustrate the use of quick hands, it was necessary to demonstrate a reaction to this process. The idea of transferring energy through the body, through the hands and into the bat was then postulated. However, this transfer could be distributed throughout the length of a swing. An improper swing, for instance, would tend to drag the bat through the hitting zone and thus the power from your swing is distributed as well. A good swing transfers all your energy at the exact point of impact. It was realized that the POP of the shot traveling through the chamber not only demonstrates the transfer of energy but as well the power transferred at this moment. The RBI Pro Swing patent application was submitted in the Spring of 2007 and immediately endorsed by Rusty Greer of the Texas Rangers. Since then, the RBI Pro Swings has found coaches, trainers and dads alike. The RBI Pro Swing has even been seen on the spring training fields of the New York Yankees.